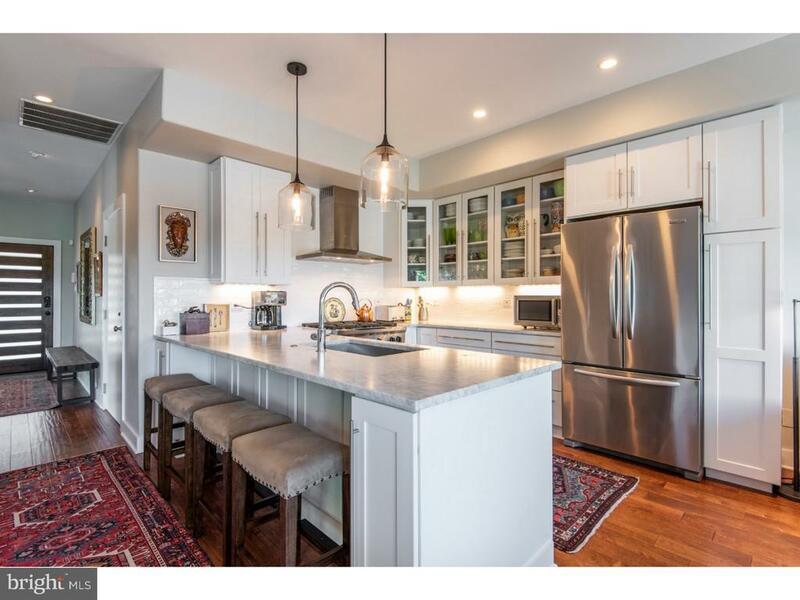 Welcome home to this exceptionally unique newer construction contemporary city house in premier Manayunk location. Formal entry foyer with powder room leads to open-concept Living room, Dining area and Chefs Eat-in kitchen. Stainless steel appliances, honed carrara marble counter tops, custom subway tile back splash and whiter shaker cabinets. Lovely step-out balcony with incredible western and sunset views. Contemporary open riser stairs throughout with custom solid metal railings and walls of glass create a truly dramatic ambiance throughout this unique home. Second floor features 2 large guest bedrooms each with their own marble bathroom, and convenient laundry room. Third floor is a fabulous master suite oasis. Large master bedroom at rear of house with sitting area and balcony affording incredible views of Manayunk bridge. Large walk-in closet with custom built-ins. Spa-like master bathroom with over sized step-in shower, double vanity and gorgeous Victoria & Albert soaking tub. Also on the 3rd floor is a cozy hall office with transom window. Ascend to the roof deck featuring even more incredible views plus hot tub - great for entertaining. Finished lower level features a large living room with linear gas fireplace, sliding glass doors leading to zen-like private flagstone patio plus gorgeous gardens that are fully enclosed. Powder room plus spacious storage room. 1-car attached garage. Short walk down the 100 steps to Main St and the train. Easy access to Center City, Main Line and the suburbs plus major highways. Approximately 6 years remain on the 10 year tax abatement. Truly an exceptional home.